Abigail (אֲבִיגָיִל - Avigáyil—"[her] Father's joy" or "fountain of joy") was a wife of King David and the widow of the wealthy herdsman Nabal the Calebite. When David was an outlaw leader estranged from King Saul, Abigail courageously visited David after her then-husband Nabal had insulted the rebel chief. She dissuaded David from taking revenge on Nabal, bringing David gifts and delivering a remarkable oration in which she predicted his rise to the Israelite kingship, and advising him not to usurp God's role by taking vengeance. Nabal then died of natural causes, and Abigail became David's wife. She was the mother of David's son, Daniel (1 Chronicles 3:1), also known as Kileab (2 Samuel 3:3). Hailed by the ancient rabbis as a prophetess and one of the Bible's "four great beauties," Abigail stands in marked contrast to David's future wife Bathsheba, who allowed herself to be seduced into adultery by David while still the wife of Uriah the Hittite, leading to David's additional sin of complicity in Uriah's death. Abigail enters the saga of the future King David just after the death of the prophet Samuel, when David has become the leader of a band of outlaws on the run from King Saul, currently operating in southern Judah near Carmel, a town southeast of Hebron. Abigail is the wife of one of the territory's wealthiest chieftains, a man named Nabal, who owns substantial lands and herds comprising 1,000 goats and 3,000 sheep. She is described as "an intelligent and beautiful woman." Nabal, on the other hand, is surly and mean in his business dealings. "When your shepherds were with us, we did not mistreat them, and the whole time they were at Carmel nothing of theirs was missing… Therefore be favorable toward my young men, since we come at a festive time. Please give your servants and your son David whatever you can find for them" (1 Samuel 25: 7-8). Nabal rudely rebuffs David's men, refusing to provide them with food and referring to David as merely one of many outlaw leaders: "Servants who have broken from their masters." 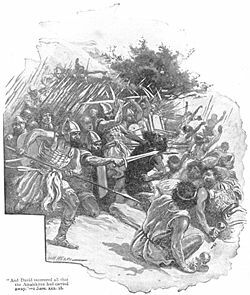 Hearing his men's report of Nabal's insult, David immediately rides with 400 of his troops to take revenge on Nabal and his people. Meanwhile, Abigail hears from a servant that Nabal has foolishly insulted David and has refused to provide him with the requested "gift." She immediately gathers 200 loaves of bread, five dressed sheep, five bushels of roasted grain, 100 cakes of raisins and 200 cakes of pressed figs, and two skins of wine and sends them with her servants in the direction of David's camp. Without mentioning this to Nabal, she rides out on a donkey and meets David in a mountain ravine. The Lord will certainly make a lasting dynasty for (David) my master, because he fights the Lord's battles. Let no wrongdoing be found in you as long as you live… When the Lord has done for my master every good thing he promised concerning him and has appointed him leader over Israel, my master will not have on his conscience the staggering burden of needless bloodshed or of having avenged himself (1 Samuel 25: 28-31). David is moved by Abigail's entreaty and withdraws the oath of vengeance he has just sworn against Nabal and his household, declaring instead: "May you be blessed for your good judgment and for keeping me from bloodshed this day and from avenging myself with my own hands… If you had not come quickly to meet me, not one male belonging to Nabal would have been left alive by daybreak." Returning to Nabal, Abigail finds him drunkenly feasting with his people. Waiting until the next morning, she informs him of David's plans to attack and of the success of her bribe. Nabal is immediately stricken with a heart attack and dies ten days later. Hearing of Nabal's death, David proposes marriage to the wise and beautiful Abigail. She accepts, bringing to the union the wealth formerly possessed by Nabal and greatly increasing David's financial strength. Abigail was not, however, David's only wife at this time, for David had also married a woman named Ahinoam of Jezreel. He had also been married to King Saul's daughter Michal, but after David's estrangement from Saul, the king had given Michal to another man, Paltiel of Gallim. Despite the new wealth brought to his forces by Nabal's land and flocks, David, Abigail, and their followers were still not safe from Saul, who possessed a much larger army. They were soon forced to ally themselves with the Philistine king Achish and settle in Gath (1 Samuel 27:3). Achish later gave David charge of the town of Ziklag, where Abigail and David lived for more than a year while David led his men on various raiding parties as Achish's agent. 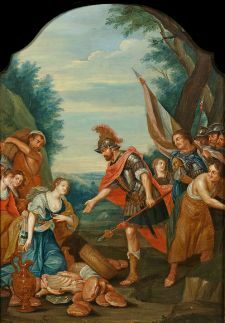 David defeats the Amalekites and rescues Abigail. When David rode with Achish in preparation for the Battle of Gilboah against King Saul, however, Abigail and the other women of the town were kidnapped by an Amelikite raiding party. David was soon providentially rejected by the other Philistine commanders from participating in the fateful battle against Saul. He returned to Ziklag only to find the town ransacked by the Amalekites. Deeply distressed at the loss of his wives and facing a mutiny from his likewise mourning troops, David consulted the priest Abiathar, who divined that it was God's will to pursue the Amalekites. Consequently, David and his men tracked the raiders down and "recovered everything the Amalekites had taken, including his two wives" (1 Samuel 30:18). Abigail is listed in 2 Samuel 3:3 as the mother of David's second son, Kileab, who, if he had lived, would have stood next in line to succeed David after the death of his first son Amnon at the hands of Absalom. 1 Chronicles 3:1 gives Kileab's name as Daniel. The reason for Kileab's being passed over are not specified, and it is likely he did not live to see David's own death. He was apparently falsely rumored to have been killed by Absalom's men in the assassination of David's first son, Amnon (2 Samuel 13:30). Neither Abigail nor her son plays a role in the subsequent biblical narratives. She may also have born daughters to David, but female offspring are rarely mentioned in the biblical accounts. Map of Israel and Judah (click to englarge). Abigail and Nabal's home of Carmel is shown to the south of Hebron, while Ziklag was located east of the Philistine city of Gerer. The map represents boundaries in the period of the Divided Kingdoms, a century or more after the time of Abigail. The ancient rabbis regarded Abigail as one of the most remarkable women in Jewish history. She was said to be one of the four great beauties, the other three being Sarah, Rahab, and Esther (Meg. 15a). Her charm was irresistible to all who gazed on her. David was immediately enthralled by her and was only restrained by Abigail's moral strength and dignity (Meg. l.c.). She was also a prophetess, who predicted David's future kingship shortly after the death of the prophet Samuel, who was the first to recognize David in this capacity. Abigail also foreshadowed the role that another woman, Bathsheba, would one day play a disastrous role in David's life. Even with all her superior qualities, some rabbis were of the opinion that Abigail was not free from feminine coquetry, for when she begged David for mercy toward her husband and predicted David's future greatness, she added the words: "Then remember thine handmaid." Some critics have identified Abigail with another woman of the same name who is described as a sister or half-sister of David and the mother of the military commander Amasa. The sources are confused about the lineage of the "second" Abigail, and the first Abigail is missing from later accounts. In the Books of Chronicles and the Septuagint version of the Books of Samuel this "second" Abigail's father is identified as being David's father Jesse, (1 Chronicles 2:13-16; 2 Samuel 17:25, LXX), but in the Masoretic text of the Books of Samuel her father is named "Nahash." Meanwhile, in the Book of Chronicles, Amasa's father is identified as "Jether the Ishmaelite" (1 Chronicles 2:17) but in the Books of Samuel, Amasa's father is identified as "Ithra the Israelite" (2 Samuel 17:25). Some hold that the two women named Abigail represent different accounts of the same person, noting that the Chronicles does not mention Abigail as one of David's wives. 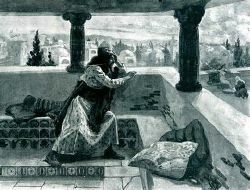 Kinship ties between David and Abigail would also explain her immediate and otherwise risky decision to express loyalty to David over her husband Nabal. While marriages between half-siblings were not allowed in the Law of Moses (Leviticus 18:9), they were not unprecedented, as Abraham and Sarah had been half-siblings. Moreover, critical scholars holds that the Law of Moses was in reality the product of a later period, which was attributed to the earlier law-giver. Abigail's behavior was the exact opposite of that of Solomon's mother Bathsheba, whose adulterous affair with David left an infamous scar on his great reputation. Where Bathsheba allowed herself to be seduced by David while still married to her husband, Uriah the Hittite, Abigail remained faithful to Nabal, yet loyal to David as well. Where Bathsheba passively allowed or invited David to sin, Abigail actively dissuaded him from doing so. Where Bathsheba's sin with David led to David's murdering his loyal commander Uriah in order to prevent Uriah's discovery of her pregnancy, Abigail stopped David from murdering the foolish Nabal. In the end, the Bible tells us, God himself struck Nabal, allowing Abigail to become David's legitimate wife, while David and Bathsheba's sin led to David's condemnation by the prophet Nathan and the death of their first child. Although Abigail did not become the ancestor of any of David's many royal descendants, she was perhaps the most deserving of David's wives. Gallares, Judette A. Images of Faith: Spirituality of Women in the Old Testament. Maryknoll, NY: Orbis Books, 1992. ISBN 9780883449431. Great Women of the Bible: The Wives of King David, Jezebel, The Shunammite Woman, Ester. A small-group Bible study series. St. Louis, MO: Concordia Pub. House, 2008. ISBN 9780758615572. Ross, Lillian Hammer, and Kyra Teis. Daughters of Eve: Strong Women of the Bible. New York: Barefoot Books, 2000. ISBN 9781902283821. This page was last modified on 23 January 2019, at 17:44.